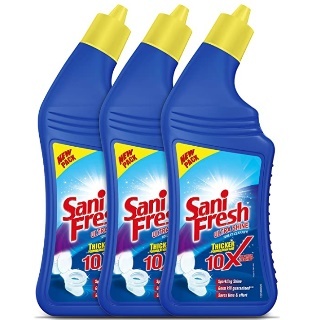 Amazon Offer - Get Buy 2 Get 1 Free on Sanifresh Ultrashine Toilet Cleaner, 500ml. Buy at just Rs.148 Only. There's nothing that makes a bathroom cleaner than a shiny toilet bowl, free of dangerous germs. The best toilet cleaner for that is Sanifresh. With an advanced shine booster formulation, it boosts cleaning power 10 times more than other cleaners and helps kill 99.9% of germs.